Call it kismet but Tillerman over at Proper Course just posted "Is Blogging Dead". It may be but I'm not changing anything on Earwigoagin and I hope those bloggers on my blog list don't either. So, after six years, let me acknowledge those bloggers I follow. They are an incredibly talented group. And let me give a tip-of-the-hat to the small cadre of "Earwigoagin" readers out there. Thanks for tuning in. "A short film from my first month sailing and rowing through the French canals in a 3m sailing dinghy. I was given the boat in the town of Rouen, 150km west of Paris. After some repairs I began my adventure, sailing and rowing up the River Siene. After about 100 km I hitched a lift on a barge and three days, two nights in the cargo hold and 200km later I was past Paris and beyond. I began to row again in the town of St Mammes and soon after turned down the River Yonne. I have travelled 100km since then and have arrived at the beginning of the Canal du Nivernais in the Burgundy region of France. A Dinghy On The French Canals. Part 1 from D.A on Vimeo. I lifted these from George A. 's blog. and put them into a PDF format. No reason these plans couldn't be modified to substitute the sit-on-deck with a small cockpit. 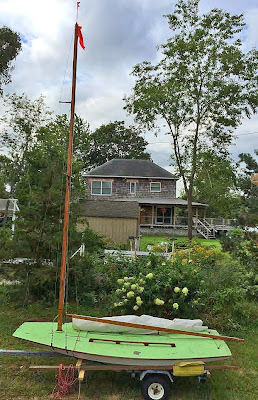 Also, to jack the sail-plan up higher, the rule of thumb for our current Classic Moths is a 17' (5182 mm) mast length with the 15' (4572 mm) luff length of the sail, leaving approx 2' (610 mm) from deck level to gooseneck. Hover the mouse over the top, black menu bar. Select the upward facing arrow icon to pop it into another tab in your browser. An original Skimmer has been found in New England. The original Rudder article with plans for the Skimmer can be found here. I got an email from Chris Museler mentioning that his friend had picked up an old Classic Moth on Cape Cod. It turned out that his friend, Yarrow Thorne, of Rhode Island, had acquired a very unique find, a Skimmer type Moth designed by William Crosby in 1933. Crosby, the editor at The Rudder magazine, had designed the deep-V Snipe in 1931, which was published and heavily promoted in The Rudder. 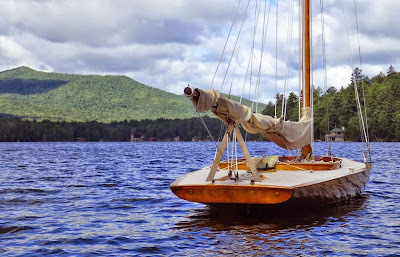 Now in the heart of the Great Depression, Crosby designed an even cheaper and easy to build sailboat in 1933, this being a catboat to fit the open 11 foot rules of the Mothboat class, a class only a couple of years old but proving to be very popular. 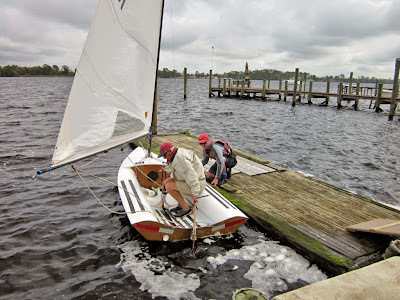 Captain Joel Van Sant out of Elizabeth City, North Carolina had built the first Mothboat, Jumping Juniper, in 1929. As with the Snipe, Crosby published the plans for Skimmer in The Rudder. 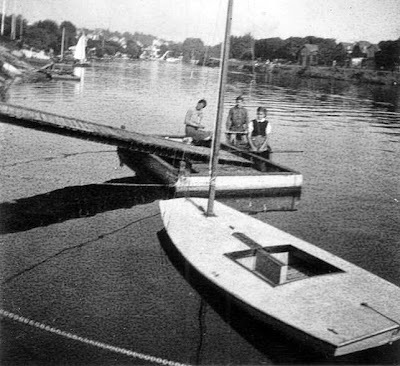 Unlike the Snipe, the Skimmer was a very shallow-V scow design with no cockpit - a true sit-on-top dinghy. As the publication of the plans for the Lark scow in The Rudder in 1898 would have enormous international impact on small boat sailing, the publishing of the plans for the Mothboat Skimmer would also have a similar international impact. 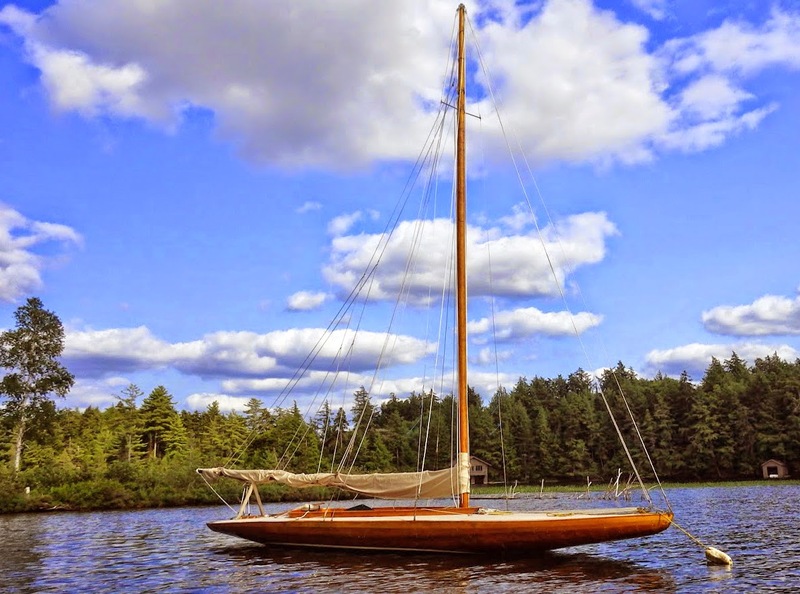 Len Morris, of Australia, had designed an 11-foot scow in 1928, a class he called the Inverloch 11-footer until he saw The Rudder article on the Skimmer and decided to change his class name to the Moth - after all his design was also an 11-foot catboat, a similar scow-type and what was the chance the Australians and American 11-footers would ever get together to race? Considering the historical importance, a Skimmer should definitely be in a museum collection such as Mystic or The Mariners Museum. Yarrow says his Skimmer Moth was built in plywood which puts the build date as possibly late 1930's or, even more likely, WWII or just after WWII. 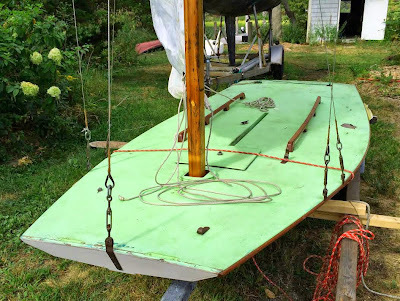 Double shrouds, high spreaders, a jumper-strut on a wood mast is very typical of the state of American Mothboat rigging before WWII. This Skimmer came without a sail, centerboard, or rudder. Yarrow was able to fit a Penquin sail on the spars. Yarrow sent along his impressions on his first sail in the Skimmer. 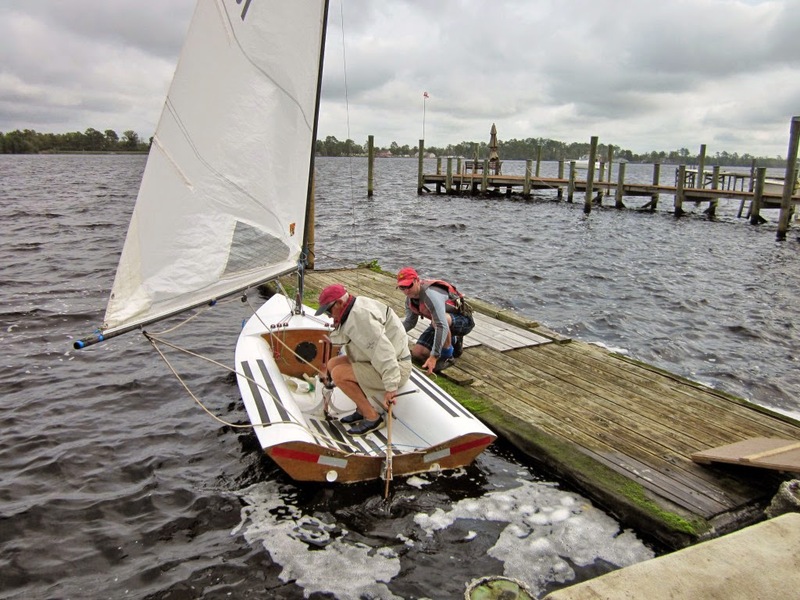 "The boat was very balanced, the sail was wrong and the tiller was too long, not allowing me to sit far back, I still need to learn how to sail but was very surprised to launch and sail within minutes for 1st time in over 30 yrs. The boat pointed OK in 20 knt's with chop, it liked the center board up a bit and I did not load the orig[inal] rig very much ;). but down wind WOW, it's a surf board and loves to have the nose even with the water, but if you get it wrong it buries the nose to the trunk in a heart beat. This photo, lifted from the Internet, courtesy of Rufus Van Gruisen. Great video of a British Moth (our U.K. compatriots in sail insignia's - we both sport the Circle M) blasting along on a reach, getting passed by the larger Phantom dinghy (who almost bought it at the jibe mark) but also going by an overturned Laser. This shows that even a pre WWII hull shape can get up and go. Some other Earwigoagin British Moth posts can be found here, including the original post "British Moth - At Speed"
Header Photo: Tweezer Gone ..... North! 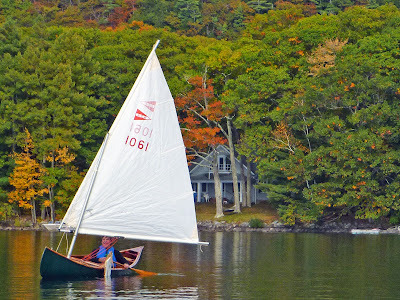 The previous header photo was of Classic Moth, Tweezer, drifting on Megunticook Lake, Camden, ME - Photo by Polly Saltonstall. 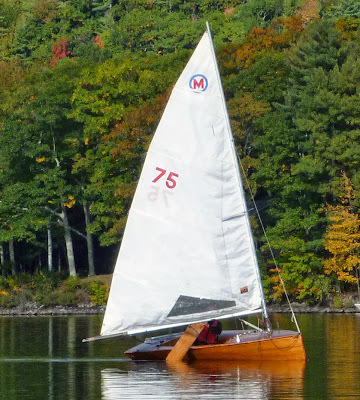 My Classic Moth Tweezer had been languishing over at Chief Boatbuilder Bill's Delaware residence since I redirected my attention in Classic Moths to putting together and racing a Gen I Maser. Bill raced her sporadically for a year or two but she had been inactive for the last couple of years. Tweezer was sold this summer to Will Sturdy of Maine, who, upon Internet research, looks to be a boat-builder and also a stunt-kite designer and builder par excellence. The clear-finished, cedar-strip Tweezer will be in good hands. This October, I was reading Carl Cramer's Woodenboat of the Week blog and came across a post of his that mentioned a Classic Moth attending a relaxed fall regatta, with the name Pollys Folly, sailed in Camden, Maine. Curious, I made an inquiry of publisher, John Hanson, one of the organizers. He confirmed, via email, that the Classic Moth racing at Pollys Folly was indeed Tweezer and directed me to his wife's (Polly Saltonstall) blog for a complete report and photos on this fun regatta. "We have a small camp on Megunticook Lake, Camden, ME. that we call Polly's ( my wife) Folly. 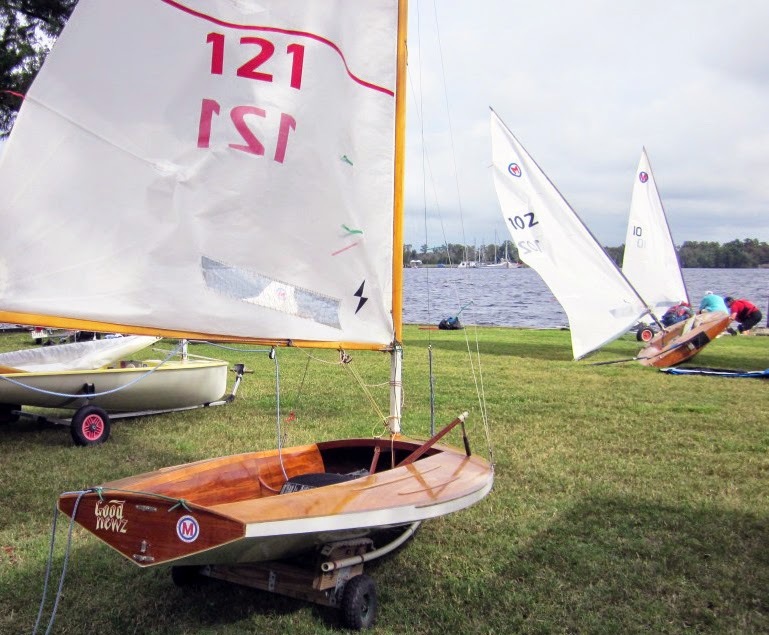 We have been doing the Fall Regatta for 10 years and we get anywhere from 10 to 20 boats of various types from single shells, kayaks, Blue Jays and usually a good fleet of Lasers. Since we began, the Laser fleet has taken on a life of its own. ... 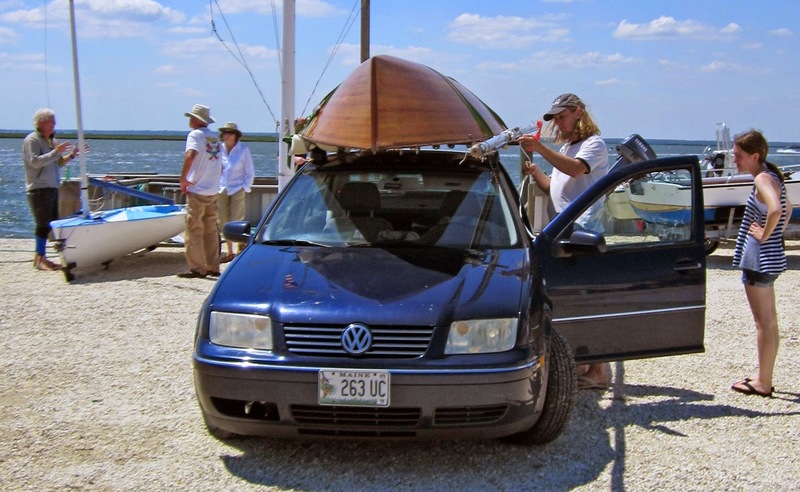 But that was never the intent with Polly's Folly, we just wanted to get more people out in small boats to end the sailing season with a bang and a barbeque, the more diverse the better." More Polly Saltonstall photos from the regatta named after her. Tweezer, heading for the barn despite the calm, being paddled with the daggerboard. John Hanson has a pretty sailing canoe with the ACA lateen rig. He steers the way pure canoeists do, with a paddle. Tweezer, starting her journey north. 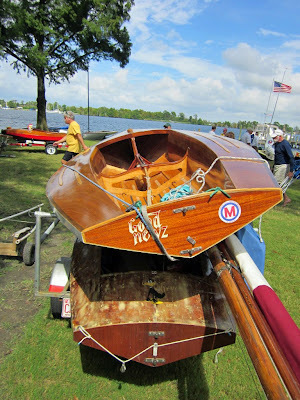 Will Sturdy picked her up at the Brigantine Regatta, N.J. this past June. Photos by John Z. Where was I before I got distracted on some other topics? Oh, that's right, I was going on about what I had seen at the Annapolis Sailboat Show. 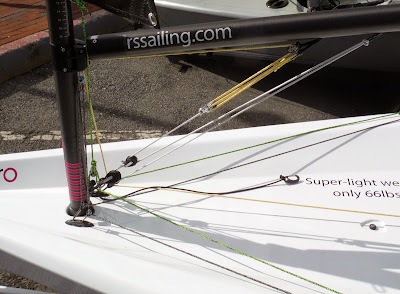 With all the hype about RS Sailing's new hiking singlehander introduced to the Laser market, the RS Aero was top on my must-see list. Initial impression as I walked up to the RS exhibit and tried to pick out the Aero from afar, was that the Aero was smaller than I imagined. I'm not sure why. The dimensions of the Aero put it smack-dab in the Laser size range but optically it was registering smaller to me. Maybe the hype had inflated the physical size of the Aero in my brain. Strange! First and foremost, when looking at the RS Aero, remember that RS designed this singlehander for racing, unlike the Laser which was originally designed to target the off-the-beach Canadian cottage sailors. (Kirby slyly put enough racing features into the Laser that,when introduced in 1971, it immediately appealed to the dinghy racers.) 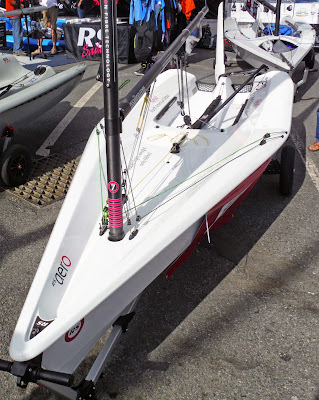 The RS Aero, as also the Devoti D-Zero, another recently introduced racing singlehander, has considerably more racing features and undoubtedly will be faster than the Laser. 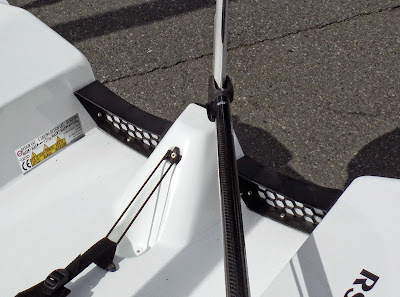 The foils sported carbon fiber trailing edges with the daggerboard having height markings already stenciled in. The foils looked to be of some laminar flow section with the max thickness close to 50% back. Laminar flow sections, famously promoted by Frank Bethwaite, are designed for higher speeds. The Aero is set up for vang sheeting and the vang, a cascading type, looked powerful enough. The problem with flow-thru double-bottom layout of the Aero is that, in light air, water can slosh over the transom and into the back of the boat, especially when the skipper is moving aft during a tack. 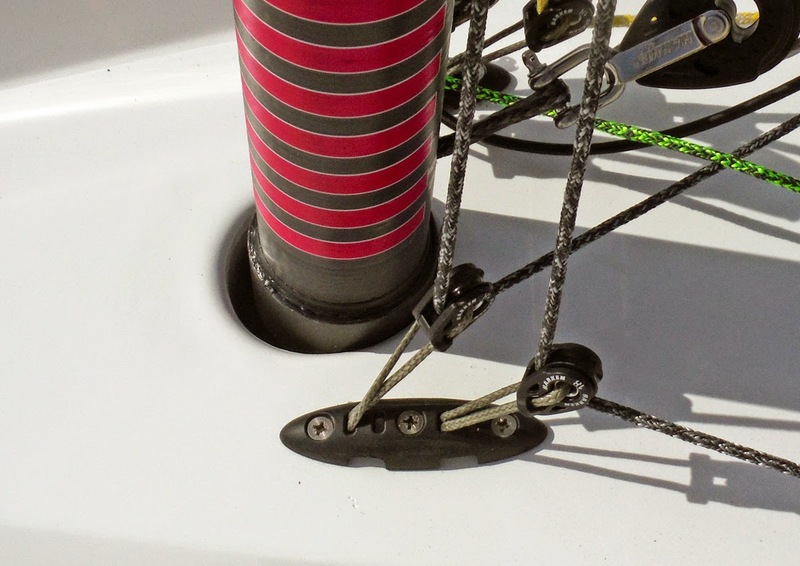 RS solves this by putting two honeycomb transom fittings with mylar flaps either side of the rudder attachment hump. RS has a clever custom designed fitting so that two turning blocks can hang off the same rope attachments, either side of the mast. Two controls are led to the side deck, the cunningham and the outhaul. The tails on these are shock corded so they don't drag in the water. The vang is led to a swivel cleat fitting sitting just forward of the daggerboard. Bow on shot. You can see the two controls led out to the gunwhales. The hiking coutour of the deck also looks particularly comfy. The cascading vang. It ends in a single part led along the bottom of the boom, thru the gooseneck, down to a turning block at the base of the mast and then to a swivel cleat in front of the daggerboard. I didn't count the purchase but it looked to have enough grunt. The trailing edge carbon strip which was on both daggerboard and rudder. This is the daggerboard with the integrated height markings. The honeycomb transom flap fitting. A simple mylar flap keeps the water out and opens up when there is enough water pressure from inside. The custom designed turning block fitting that utilizes modern rope attachment technology. And finally, you can't truly kick the tires at a boat show. 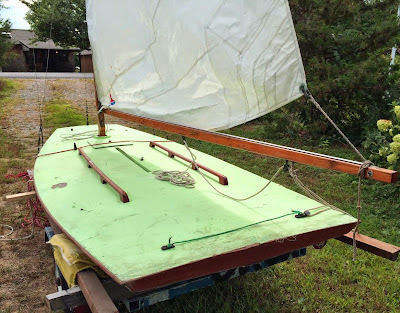 You need some hands-on experience and for that it is best to jump over to Tillerman at Aerobian.com who is actually a passionate Aero sailor and is blogging about his impressions. I didn't make it to the Classic Moth Nationals this year. 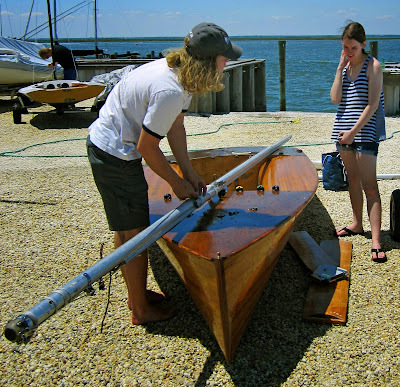 That weekend I was floating around Annapolis Harbor on a Herreshoff Rozinante. John Z sent along some photos of the event so, in keeping with the dictum of the bloggosphere... when you have material, write about it (even when you were nowhere near the action). Saturday was breezy, blowing across the Elizabeth City River, as it is a majority of the time (though a little eastward this year). Sunday was lighter and flukier with about the same direction. 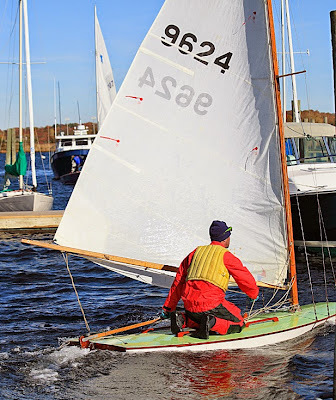 George A. over at Mid-Atlantic Musings actually attended the regatta and has written an extensive report complete with a large selection of excellent photos from Hope Malott, I recommend you read his post; click here. Some photos. Most are from John Z with the exceptions noted. As always, to get higher resolution, click inside the photo. "Mike Albert won the Nats in 1997 sailing the ex-Bill Schill Cates, Pegasus, over Joe Bousquet's Mistral (Joe failed to attend the skipper's meeting and was dsq'ed for passing through the start/finish line on a critical race. This faux pas cost Joe B. the regatta). This was before we had the Gen I and II divisions and shows that a Cates in the right hands could be competitive against the best boats of that era. Jeff Linton also was able to almost beat Mark Saunders and co. the first time he raced a Moth down at St. Pete, sailing an old beat up Fletcher-Cates he borrowed from Ken Willus." Gary Gowan's two Mothboat trailer rig ready for the homebound trip. His pretty Gen I winner is on top with a winter project Vintage hull on the bottom. 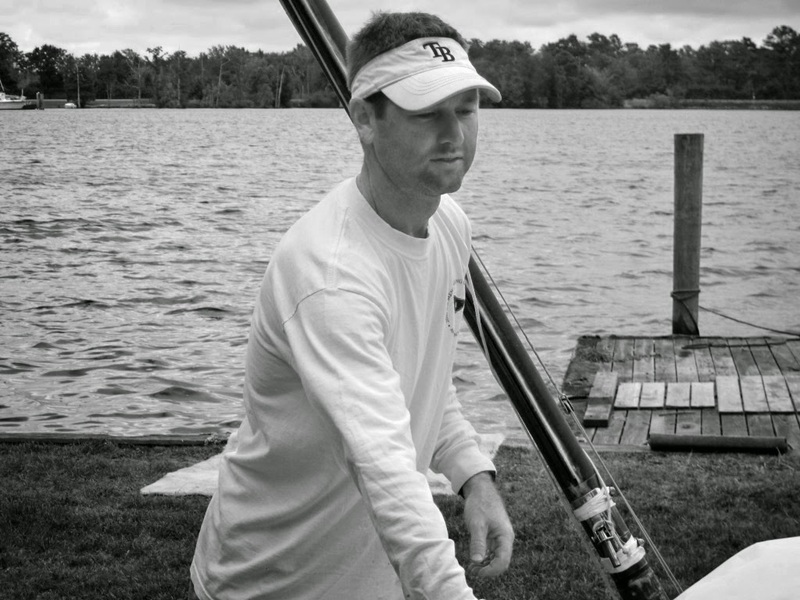 Jamey Rabbit is at least ten years older from the last time he appeared at the Nationals but he hasn't lost the magic sailing touch of his youth. He had six 1st place finishes out of eight races. 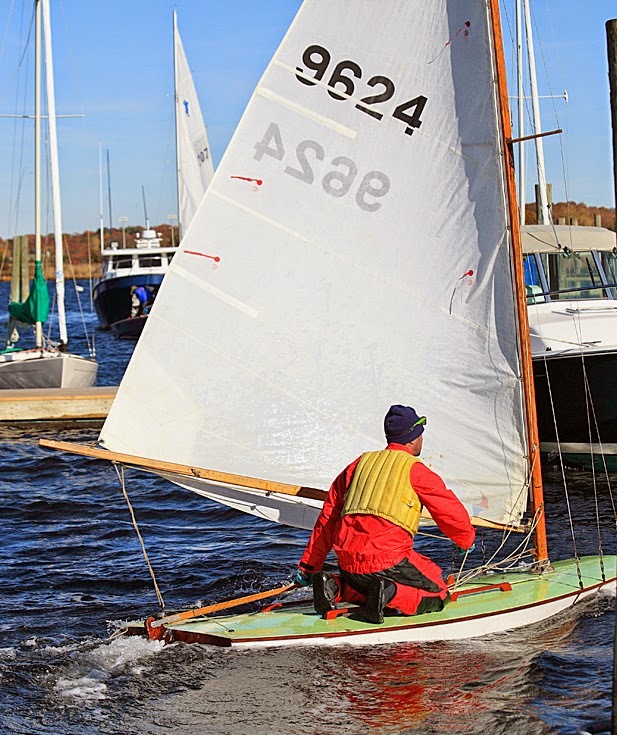 A Hope Malott photo of Jamey rounding a leeward mark. Concentration plus plaid sailing shorts. Now that's stylin! Another Hope Malott photo. This is fellow Marylander Victor Stango launching from the Pugh's property for Saturdays racing. Victor has a wider Gen I Lindenberg design. The Classic Moths are all about diversity. 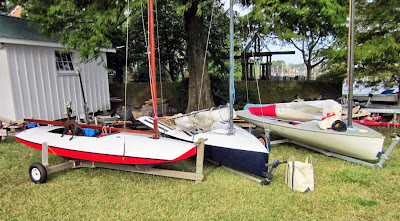 From left to right, a Vintage Ventnor with a wood mast (all Vintage Mothboats have to sail with a wooden mast), a Gen I Lindenberg, and a Gen I Olympic Europe. 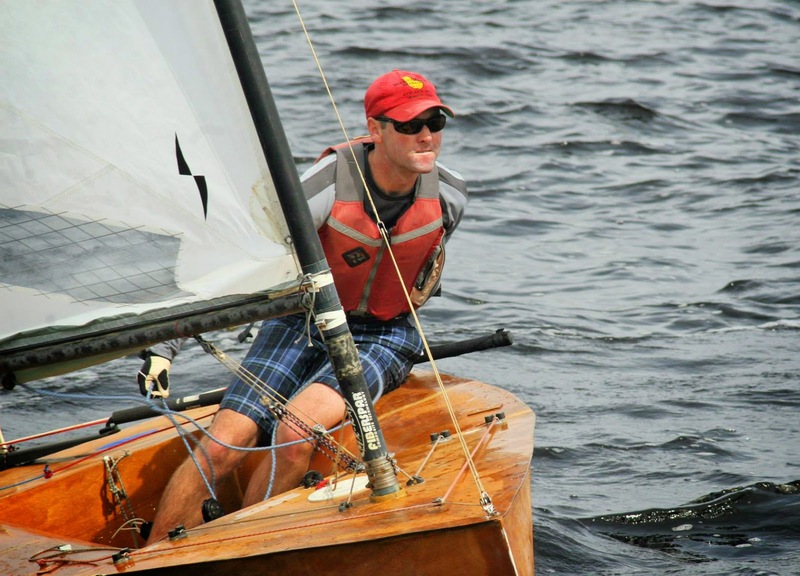 The Results of the 2014 Classic Moth Nationals. The Gen II winner is marked with yellow, the Gen I winner is marked with green, the Vintage and National Champion is marked with orange. 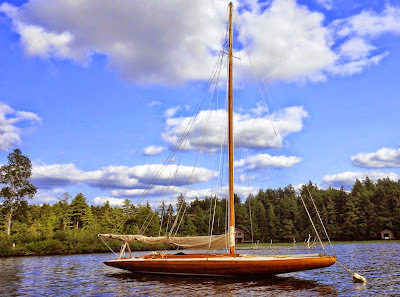 Andre Cloutier over at the Ravenwood blog took some fetching photos of the Idem class sloop Elfmere when he was attending the Wooden Heritage Canoe Association Assembly on Lower St. Regis Lake. His original post of the WHCA gathering can be found here. I have posted before on Earwigoagin about the Crane designed Idem class sloops where I provided more details about one of America's oldest racing classes. In the early 1900's, St. Regis Lake was the summer destination for many of New York City's upper-upper crust as the New York Times reported in this 1902 piece. "The month, of August in the Adirondacks opens with all the camps occupied, with possibly a few exceptions, and in those instances preparations are hastened to have everything in readiness for the coming in the near future of those who are to occupy them. Of camp life in the Adirondacks this season it may be said that it is the most fashionable of years, for the Vanderbilts, the Rockefellers, the Reids, the Morgans, the Blaines, the McCormicks, the Stokeses, the Mortons, and many others are in their camps, some of which are new and others of which were enlarged and extended In anticipation of entertaining many friends during August and September. This, together with the number and class of the applicants who have reserved apartments at Paul Smith's for August and September indicates that the St. Regis Chain of Lakes will he the rendezvous of many persons distinguished in the financial and business worlds; as well as the social world. More of the interesting history of the St. Regis Yacht Club can be found over at their Wiki page. And here is a particularly well-done drone video of the Wooden Canoe Heritage Association showing the stunning beauty of the lake region. Wooden Canoe Heritage Association 2014 Assembly from Above the World Films on Vimeo.